Please refer to our stock # 1615 when inquiring. 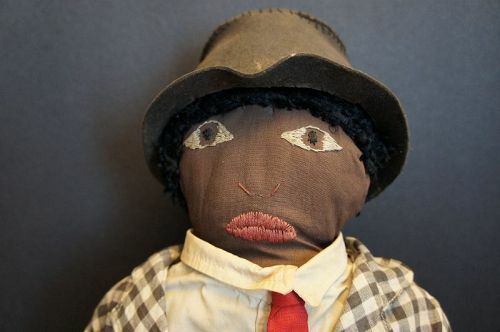 This is a very nice African American cloth man doll in suit and tie and homemade antique hat, (I added). This doll was in the collection of Lenon Holder Hoyte and was exhibited at Aunt Len's museum. This collection was sold a Sotheby's in December 16, 1994 and this doll was one of them. He is made with brown cotton and has astrakhan hair. His face is embroidered very nicely with silk floss. He is wearing a black and white check suit, a tan shirt that has discolored to yellow, and a red tie and antique tape suspenders. He is pretty firmly stuffed with cotton. Arms and legs are jointed so he is flexible. He is 19" tall and a great example of a all original black cloth doll. No condition problems other than age discoloration.